Updating our technical analysis of the Singapore package, we go further in-depth and add photos for clearer understanding. According German sources, the major car upgrade BMW Sauber brought to Singapore can improve the F1.09 pace by up to 1 second per lap, or that is what windtunnel data is showing. This would be a huge gain, effectively the biggest of the season for the Hinwil-based team. However Singapore wasn’t the best circuit to show this improvement, with Singapore pace relying more on mechanical grip rather than only aero. Suzuka, on the other hand, will be a much better indication of how good this step is. 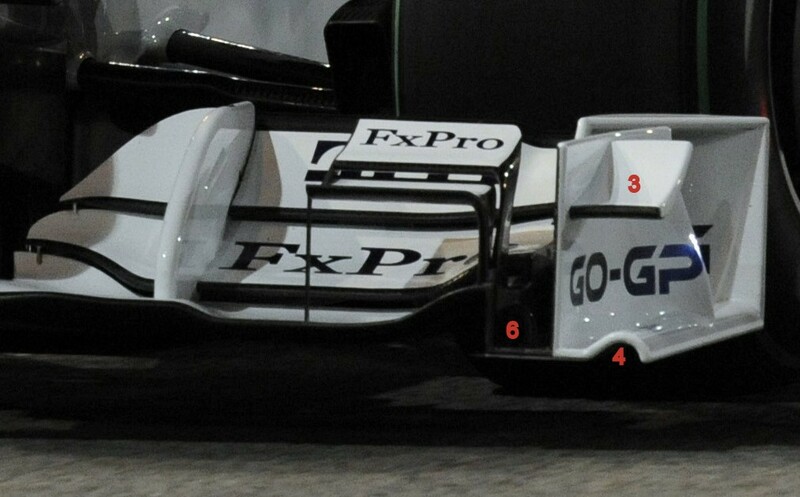 -Brand new front wing: finally the “simplistic aspect” wing endplates have been modified heavily. Now they sport a lay out very similar to the one first introduced by Brawn, with two vertical planes , both of them curving outwards to direct the airflow around the front wheel in a more efficient way. In the outside of the first plane a wing profile  with a high angle of attack has been fitted. 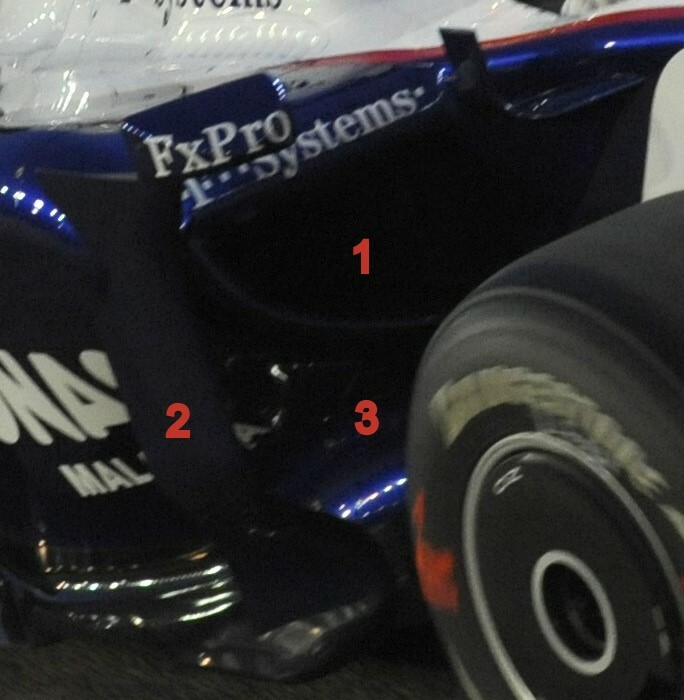 Only the rear part of these endplates is still similar to previous designs, including the lower venturi channel  and the upper horizontal layer. While the lower main planes of the wing have remained mostly unchanged, the upper so-called mini upper decker is totally new. Partially inspired in the Red Bull and Brawn, it has two tiny planes, on the exterior attached to the base by a thin but long fin, and the interior just supported by a very thin vertical pillar that connects with the lowest profile of the entire front wing. 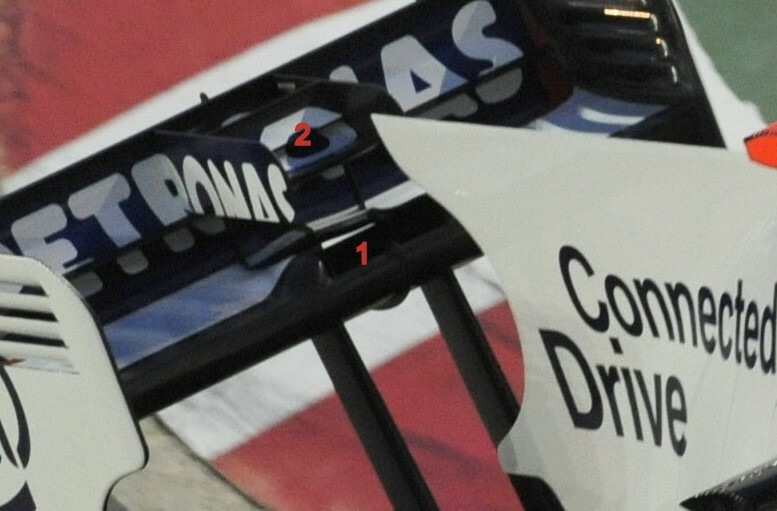 Additionally between the exterior attachment and the front endplate plane another small channel, similar to Mclaren’s, can be noticed. Note that the inner fences, which have been there for all season, hide the wing angle regulation device . -Innovating rear view mirrors/cockpit area design: this has been a major surprise, and certainly an innovation. They follow the trend of Brawn and others of using the mirrors support as flow re-directors. Up to this, nothing is new…until you notice that actually the mirrors themselves aren’t there! Instead they are placed in the vertical fins of the sidepods , as has been used by the German-Swiss squad this season. 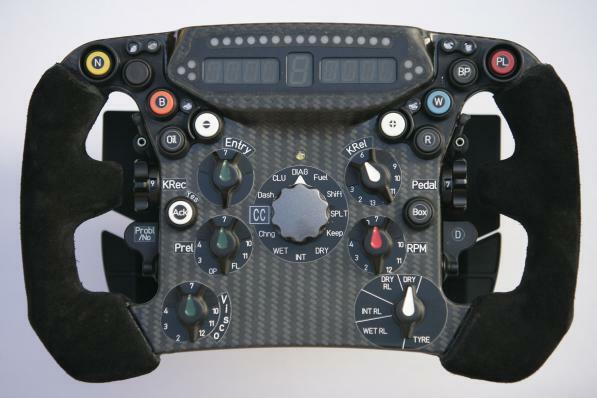 So then we notice that actually the mentioned in board pseudo mirror supports  actually are a bit like the “Viking horns” used by Mclaren and BMW till last year. Taking a close look, it is noticeable that in fact their cross section is a wing profile, but with neutral shape, virtually generating nor downforce nor lift. While a small amount of drag is produced, it is offset by a better airflow over the sidepods and the sides of the engine cover. We aren’t sure if they intend to generate vortex, as well, to energize the flow and make the boundary layer stick furthermore to the bodywork, reducing drag…just like the front “deer horns” used to do in the F1.08. On he other hand, another more likely possibility given their shape is that they act to "cut" a turbulence in that area created further upstream -front suspension arms-. -New sidepods: after the Valencia update, the F1.09 already featured one of the smallest air inlets, but it is clear the Hinwil technicians weren’t satisfied enough. 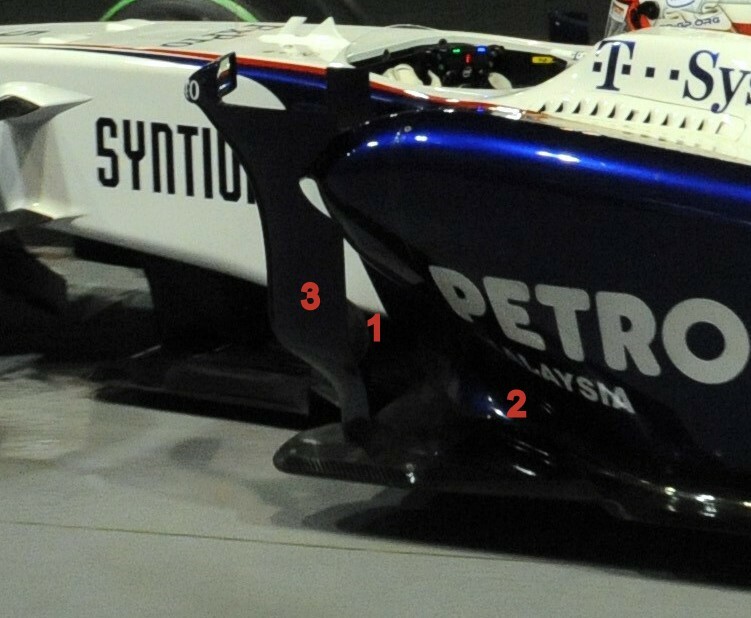 For Singapore the sidepods are further undercut and it seems that BMW Sauber may be running the smallest inlets of all teams. What a contrast compared to the F1.09 KERS-equipped launch version! The undercut, viewed from the side, resembles a lot to those of the Brawn. 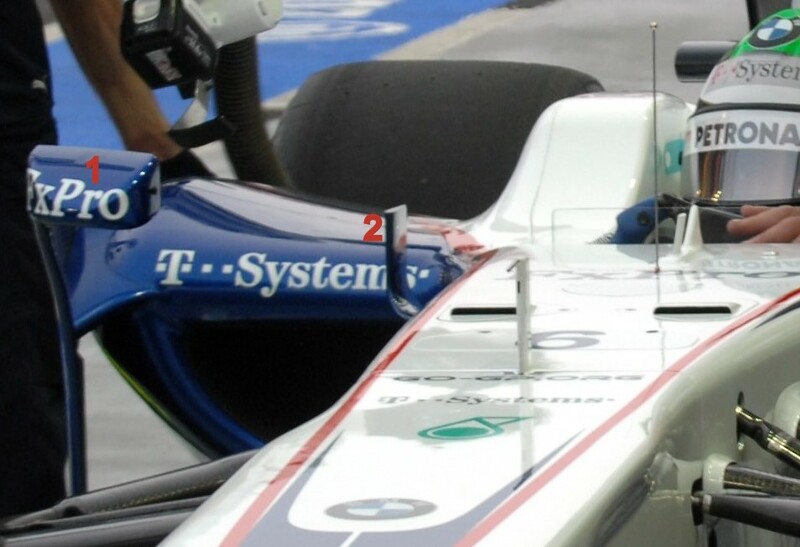 BMW had already re-designed completely the radiators and refrigeration lay out for the Valencia package, to allow the more undercut sidepods, and probably the Singapore’s is an evolution of this design. In our memories still remains the late Sauber/early BMW Sauber days when the car run a compact, but heavier, two 45º inclined radiator instead of the conventional single lay out. Did they get it back? The aim of further undercutting the sidepods is both to reduce drag (the smaller the flow for refrigeration, the less parasite drag) and further feed with air the upper part of the floor and diffuser, as well as a reduced frontal cross section resulting in less aerodynamic resistance. -New barge boards/turning vane and vertical fin: a new, larger barge board  has been fitted, resembling Ferrari’s. It has been increased thanks to the increased room left by the deeper undercut of the sidepod, and as well due to the need of channeling more flow in this lower part. As well it has a greater angle to the air flow-the previous version being almost parallel, but the current one at around 45degrees. The vertical fin  on the external sides of the sidepod, which also acts as the mirrors’ support, has been increased in size too in a very subtle way, and the shape has changed slightly, with some more “aggressive” curved shapes. -New engine cover: tiny changes have been done to the already existent shark fin engine cover introduce a couple of races ago. 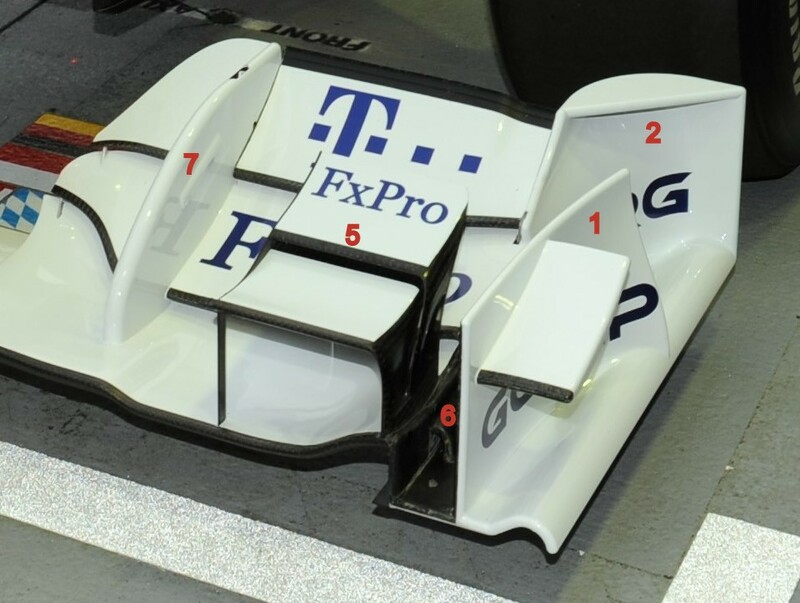 The aim of this type of cover is to “straight” the flow (prevent turbulences, as a more laminar flow to the rear wing is preferred) and also still feed the rear wing with air while under yaw –turning around the vertical axis-. The downsides are the increase sensitiveness to cross winds and slightly increased skin friction drag due to bigger lateral surface. The new cover spec changes the lower part, and resembles to Toyota’s, with now an almost symmetrical “C” , and then under the lower extreme of that C there is another undercut. -New rear wing: continuing with the design fist implemented in the Spanish GP, now the wing has a big hole  in the lower plane, just below the minor central extra planes. This concept is based on a Mclaren idea introduced in Monaco, but with an even more complex design which includes two mini vertical fences, and is placed more rearwards than Mclaren’s design. The hole provides more downforce, and while it also improves the downforce/drag ratio and reduces the possibility of the wing stalling (hence allowing to run more wing angle), overall it increases drag slightly. 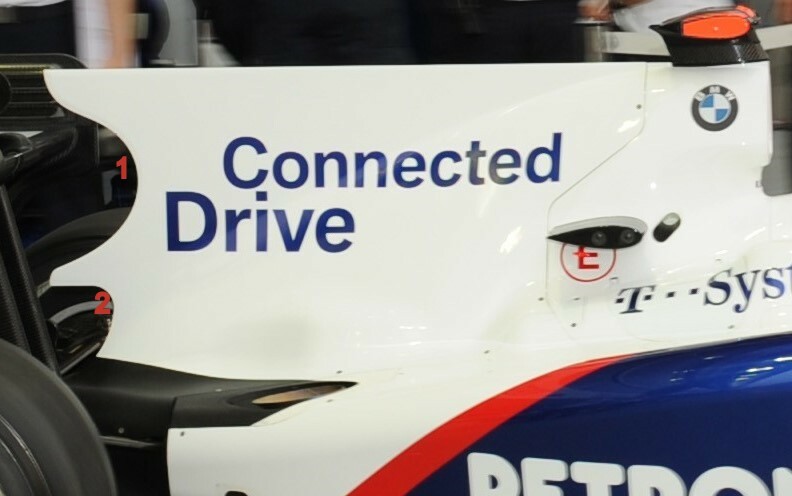 As explained by Pedro Martinez de la Rosa, Mclaren’s test and reserve driver, this feature reduced the car top speed by 2 or 3km/h in the streets of the Principality, but added a significant amount of downforce at the rear…something definitely aimed by BMW Sauber in Singapore’s street circuit. -New diffuser: thanks to the totally re-designed gearbox, the diffuser channels can be longer, and go higher. Taking the version of the British Grand prix as starting point, the new diffuser grows and while most of the shape of its lower level remains unchanged, the upper channel (“invented” by the so-called double diffuser teams) has been increased, most noticeable in wideness . As well, due to a shorter gearbox and re-designed rear impact structure , the diffuser can have a ‘cleaner’ air exit . We haven’t been able to obtain a clear enough photo of this part to go into more detail or show it in a clearer way…but we promise that as soon as we succeed in doing so, we will dedicate a full article on it. We have no confirmation of other internals changes, but we have heard modifications to the rear suspension have been carried out, and we suspect slight reductions of weight, to accommodate more ballast, were done too. Photos provided by BMW AG. It seems Craig might be reading this site a bit lol! 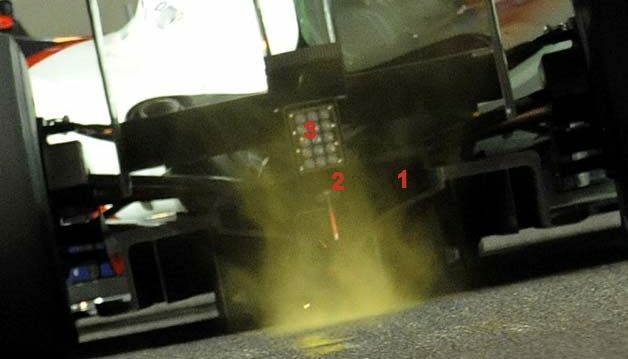 As for the diffuser, I've managed to find such a photo.